Artamonova, Elena; Svenning, Jon Brage; Vasskog, Terje; Hansen, Espen; Eilertsen, Hans Christian. Analysis of phospholipids and neutral lipids in three common northern cold water diatoms: Coscinodiscus concinnus, Porosira glacialis, and Chaetoceros socialis, by ultra-high performance liquid chromatography-mass spectrometry. Journal of Applied Phycology 2017; Volum 29 (3). ISSN 0921-8971.s 1241 - 1249.s doi: 10.1007/s10811-017-1055-0. Moldes-Anaya, Angel; Sæther, Thomas; Uhlig, Silvio; Nebb, Hilde Irene; Larsen, Terje; Eilertsen, Hans Christian; Paulsen, Steinar Martin. Two Isomeric C16 Oxo-Fatty Acids from the Diatom Chaetoceros karianus Show Dual Agonist Activity towards Human Peroxisome Proliferator-Activated Receptors (PPARs) α/γ. (fulltekst) Marine Drugs 2017; Volum 15 (148). ISSN 1660-3397.s doi: 10.3390/md15060148. Artamonova, Elena; Vasskog, Terje; Eilertsen, Hans Christian. Lipid content and fatty acid composition of Porosira glacialis and Attheya longicornis in response to carbon dioxide (CO2) aeration. PLoS ONE 2017; Volum 12:e0177703 (5). ISSN 1932-6203.s 1 - 9.s doi: 10.1371/journal.pone.0177703. Gudimova, Elena; Eilertsen, Hans Christian; Jørgensen, Trond Ø.; Hansen, Espen. In vivo exposure to northern diatoms arrests sea urchin embryonic development. Toxicon 2016; Volum 109. ISSN 0041-0101.s 63 - 69.s doi: 10.1016/j.toxicon.2015.11.001. Colléter, Julie; Penman, David J; Lallement, Stephane; Fauvel, Christian; Hanebrekke, Tanja Lexau; Osvik, Renate Døving; Eilertsen, Hans Christian; D'Cotta, Helena; Chatain, Beatrice; Peruzzi, Stefano. Genetic Inactivation of European Sea Bass (Dicentrarchus labrax L.) Eggs Using UV-Irradiation: Observations and Perspectives. (fulltekst) PLoS ONE 2014; Volum 9 (10). ISSN 1932-6203.s doi: 10.1371/journal.pone.0109572. Degerlund, Maria; Eilertsen, Hans Christian. Main Species Characteristics of Phytoplankton Spring Blooms in NE Atlantic and Arctic Waters (68-80oN). Estuaries and Coasts 2010; Volum 33 (2). ISSN 1559-2723.s 242 - 269.s doi: 10.1007/s12237-009-9167-7. Eilertsen, Hans Christian; Degerlund, Maria. Phytoplankton and light during the northern high-latitude winter. Journal of Plankton Research 2010; Volum 32 (6). ISSN 0142-7873.s 899 - 912.s doi: 10.1093/plankt/fbq017. Norrbin, Fredrika; Eilertsen, Hans Christian; Degerlund, Maria Ingeborg. Vertical distribution of primary producers and zooplankton grazers during different phases of the Arctic spring bloom. Deep-sea research. Part II, Topical studies in oceanography 2009; Volum 56 (21-22). ISSN 0967-0645.s 1945 - 1958.s doi: 10.1016/j.dsr2.2008.11.006. Eilertsen, Hans C.; Frantzen, Sylvia. Phytoplankton from two sub-Arctic fjords in northern Norway 2002-2004: I. Seasonal variations in chlorophyll a and bloom dynamics. (omtale) Marine Biology Research 2007; Volum 3 (5). ISSN 1745-1000.s 319 - 332. Hansen, Espen; Eilertsen, Hans Christian. Do the polyunsaturated aldehydes produced by Phaeocystis pouchetii (Hariot) Lagerheim influence diatom growth during the spring bloom in Northern Norway?. Journal of Plankton Research 2007; Volum 29 (1). ISSN 0142-7873.s 87 - 96.s doi: 10.1093/plankt/fb1065. Eilertsen, Hans Christian; Wyatt, Tim; Hansen, Espen. Can ultraviolet radiation influence cod Gadus morhua L. year class strength: a model study. Journal of Fish Biology 2007; Volum 70. ISSN 0022-1112.s 1120 - 1133.s doi: 10.1111/j.1095-8649.2007.01377.x. Eilertsen, Hans Christian; Frantzen, Sylvia. Phytoplankton from two sub-Arctic fjords in northern Norway 2002-2004: I. Seasonal variations in chlorophyll a and bloom dynamics. Marine Biology Research 2007; Volum 3. ISSN 1745-1000.s 319 - 332.s doi: 10.1080/17451000701632877. Haslam, Richard P. Haslam; Keys, Alfred J.; Andralojc, P. John; Madgwick, Pippa J.; Andersson, Inger; Grimsrud, Anette Sophie; Eilertsen, Hans C.; Parry, Martin A. J.. Specificity of diatom Rubisco. Springer 2006 ISBN 978-4-431-31013-6. Eilertsen, Hans Chr. ; Skarðhamar, Jofrid. Temperatures of north Norwegian fjords and coastal waters: Variability, significance of local processes and air-sea heat exchange. Estuarine, Coastal and Shelf Science 2006; Volum 67. ISSN 0272-7714.s 530 - 538. Hansen, espen; Ernstsen, Arild; Eilertsen, Hans Christian. Isolation and characterisation of a cytotoxic polyunsaturated aldehyde from the marine phytoplankter Phaeocystis pouchetii (Hariot) Lagerheim. Toxicology 2004; Volum 199. ISSN 0300-483X.s 207 - 217. Hansen, Espen; Ernstsen, Arild; Eilertsen, Hans Christian; Genevière, Anne-Marie. Anti-mitotic activity towards sea urchin embryos in extracts from the marine haptophycean Phaeocystis pouchetii (Hariot) Lagerheim collected along the coast of northern Norway. Toxicon 2003; Volum 41. ISSN 0041-0101.s 803 - 812. Hansen, Espen; Eilertsen, Hans Christian; Ernstsen, Arild; Genevière, Anne-Marie. Anti-mitotic activity towards sea urchin embryos in extracts from the marine haptophytean Phaeocystis pouchetii (Hariot) Lagerheim collected along the coast of northern Norway. (fulltekst) Toxicon 2003; Volum 41. ISSN 0041-0101.s 803 - 812. Skreslet, Stig; Alonso, Carolina; Borja, Angel; Eilertsen, Hans Christian; Hansen, Georg Heinrich; Meerkoetter, Ralf; Saborido-Rey, Francisco; Verdebout, Jean; Wyatt, Timothy. UVAC, the influence of UVR and climate conditions on fish stocks: a case study of Northeast Arctic cod. 2002 (252). ISSN 1017-6195.s 86 - 88. Stabell, Ole B.; Aanesen, R.T.; Eilertsen, H.C.. Toxic peculiarities of the marine alga Phaeocystis pouchetii detected by in vivo and in vitro bioassay methods. Aquatic Toxicology 1999; Volum 44 (4). ISSN 0166-445X.s 279 - 288. Osvik, Renate Døving; Hansen, Espen; Eilertsen, Hans Christian; Genevière, Anne-Marie. Extract of a marine diatom negatively affects development in sea urchin (Paracentrotus lividus) embryos. BIOPROSP_19 2019-02-25 - 2019-02-27 2019. Lehmuskero, Anni Maria; Brembu, Tore; Eilertsen, Hans Christian; Boström, Tobias. Light scattering in dense diatom cultures in the multiple scattering regime. Algal Biomass, Biofuels, and Bioproducts 2017-06-18 - 2017-06-21 2017. Eilertsen, Hans Christian; Strømholt, Jo Hemming; Flekkøy, Kjetil Grude. Mikroalger gir nytt oljeeventyr, Bellona Havbruksmagasin. 2017. Lehmuskero, Anni Maria; Boström, Tobias; Eilertsen, Hans Christian. Light losses and growth in microalgal suspensions: Size matters. Solar fuels conference 2015-04-26 - 2015-05-01 2015. Novoa-Garrido, Margarita; Røeggen, Anders; Eilertsen, Hans Christian. Alger - en del av fremtidens havbruk. 2015. Rapp, Ole Magnus; Eilertsen, Hans Christian. Nærmer seg ny medisin. 2013. Huang, Tien-Sheng; Eilertsen, Hans Christian; Olsen, Ragnar Ludvig; Hofer, Tim; Jørgensen, Trond Ø.. Antioxidant property of the Arctic microalgae Attheya longicornis and Pyramimoras sp. upon abiotic stress from metal and UV radiation. The 6th International Conference on Marine Bioprospecting 2013-02-20 - 2013-02-22 2013. Lacey, Joff; Eilertsen, Hans Christian. The hunt for antibiotics. 2013. Bråthen, Torgeir (avisa Nordlys); Eilertsen, Hans Christian. Alger inn på verket. 2013. Wengstad, Morten; Eilertsen, Hans Christian. Jaktet på ukjente bioorganismer. 2012. Rapp, Ole Magnus; Eilertsen, Hans Christian. Nå skal algene lage laksemat. 2012. Eilertsen, Hans Christian; Jørgensen, Trond; Elvevoll, Edel Oddny. Hva om vi dyrket havet på land?. Dagavisen Nordlys 2011.s 3 - 3. Karlsen, Marius; Eilertsen, Hans Christian. Vil masseprodusere super-alger ved hjelp av smelteverk. 2011. Bjerkaas, Hans Tore; Sæther, Anders; Eilertsen, Hans Christian. Sjøsprøyt. 2011. Norrbin, Fredrika; Jacobsen, Helge Petter; Eilertsen, Hans Christian. FINE-SCALE VERTICAL STRUCTURE OF CALANUS POPULATIONS IN DIFFERENT BLOOM SITUATIONS AND WATER MASSES IN THE BARENTS SEA AND POLAR SEA NORTH OF SVALBARD. ASLO Aquatic Sciences Meeting 2007-02-03 - 2007-03-09 2007. Norrbin, Fredrika; Eilertsen, Hans Christian; Degerlund, Maria Ingeborg. Vertical distribution of primary producers and zooplankton grazers during different phases of the Barents Sea spring bloom: variability in energy transfer patterns and efficiency. Econorth 2007-03-12 - 2007-03-15 2007. Hamre, Børge; Eilertsen, Hans Christian; Stamnes, Jakob J.; Stamnes, Knut. The importance of a realistic light regime in marine phytoplankton models. Ocean Optics XV 2000-10-16 - 2000-10-20 2000. Hamre, Børge; Eilertsen, Hans Christian; Stamnes, Jakob J.; Stamnes, Knut. The importance of a realistic light regime in marine phytoplankton models. Ocean Optics XV 2000. Hopkins, C. C. E., Falk-Petersen, S., Tande, K. & Eilertsen, H.C. 1978. A premilinary study of zooplankton sound scatterin layers in Balsfjorden: Structure, Energetics, and migrations. Sarsia 63, 255-264. Eilertsen, H.C., Falk-Petersen, S., Hopkins, C.C.E. and K. Tande. 1981. Ecological investigations on the plankton community of Balsfjorden, Northern Norway. Program for the project, study area, topography, and physical environment. Sarsia 66, 25-34. Eilertsen, H. C. &. Taasen, J.P. 1981. Diel variations in some important phytoplankton parameters during a 24 hours sampling period in Balsfjorden, Troms and Skjomenfjorden, Nordland, North Norway. 1981. Kieler Meeresforsch., Sonderh. 5, 68-81. Eilertsen, H. C., Schei, B. & Taasen, J. P. 1981. Investigations on the plankton community og Balsfjorden, Northern Norway. The phytoplankton 1976 - 1978. Abundance, species composition, and succession. Sarsia 66, 129-141. Kullenberg, G., Buch, E., Owens, R. & Eilertsen, H. C. 1982. Tracing Internal layers of plankton., Biological Oceanography Comm., L 18, 1-10. ICES Annual Meeting 1982. Eilertsen, H. C. & Taasen, J.P. 1984. Investigations on the plankton community of Balsfjorden, Northern Norway. The phytoplankton 1976 - 1978. environmental factors, dynamics of growth, and primary production. Sarsia 69, 1-15. Sargent, J. R., Eilertsen, H. C., Falk-Petersen, S. & Taasen, J.P. 1985. Carbon assimilation and lipid production in phytoplankton in northern Norwegian fjords. Mar. Biol. 85, 109-116. Huntley, M., Tande, K. &. Eilertsen, H.C. 1987. On the trophic fate of Phaeocystis pouchetii II. Grazing rates of Calanus hyperboreus on diatoms and different size categories of P. pouchetii. J. exp. mar. Biol. Ecol. 110, 197-212. Eilertsen, H. C. 1989. Phaeocystis pouchetii (Hariot) Lagerheim: a key species in Arctic marine ecosystems: Life history and physiology. Rapp. P.-v. reun. Cons. int. Explor. Mer. 188, 131. Eilertsen, H. C., Taasen, J. P. & Weslawski, J. M. 1989. Phytoplankton studies in the fjords of West Spitzbergen: Physical environment and production in spring and summer. J. Plankt. Res. 11(6), 1245-1260. Eilertsen, H. C., Tande K. S. & Nøst Hegseth, E. 1989. Potential of herbivorous copepods for regulating the spring bloom in the Barents Sea. Rapp. P.-v. Reun. Cons. int. Explor. Mer. 188, 154-163. Eilertsen, H. C., Tande K. S. & Taasen, J. P. 1989. Vertical distributions of primary production and grazing by Calanus glacialis Jaschnov and C. hyperboreus Krøyer in Arctic Waters (Barents Sea). Polar. Biol. 9, 253-260. Pedersen, T., Eliassen, J. E., Eilertsen, H. C., Tande, K. S. & Olsen, R. E. 1989. Feeding, growth, lipid composition and survival of Cod (Gadus Morhua L.) larvae related to environmental conditions in an enclosure at 700 N in Northern Norway. Rapp. P.-v. Réun. Cons. int. Explor. Mer. 191, 409-420. Båmstedt, U., Eilertsen, H. C., Tande, K. S., Slagstad, D. & Skjoldal, H. R. 1992. Copepod grazing and its potential impact on the phytoplankton development in the Barents Sea. Polar Res. 10(2), 339-353. Hansen, B., Berggreen, U. C., Tande, K. S. & Eilertsen, H.C. 1990. Post-bloom grazing of Calanus glacialis, C. finmarchicus and C. hyperboreus in the region of the polar front, Barents Sea. Mar. Biol. 104, 5-14. Henderson, J., Olsen, R. E- & Eilertsen, H.C. 1990. Lipid composition of phytoplankton from the Barents Sea and environmental influences on the distribution pattern of carbon among photosynthetic end products. Polar Res. 10(1), 229-237. Eilertsen, H. C. Spring blooms and stratification. 1993. Nature 363, 24. Eilertsen, H. C., Hansen, G. A., Svendsen, H. & Hegseth, E. N. 1993. The onset of the spring phytoplankton bloom in the Barents Sea: Influence of changing light regime and other environmental factors. SPIE 2048, 20-32. Hansen, G. A., Eilertsen, H. C., Hegseth, E. N. & Henriksen, K. 1993. On the submarine light field in a phytoplankton model. SPIE 2048, 168-171. Eilertsen, H. C., S. Sandberg & Tøllefsen, H. 1995. Photoperiodic control of diatom spore growth; a theory to explain the onset of phytoplankton blooms. Mar. Ecol. Prog. Ser. 116, 303-307. Eilertsen, H. C. & Raa, J. 1995. Toxins in seawater produced by a common phytoplankter: Phaeocystis pouchetii. J. Mar Biotechnol. 3, 115-119. Hansen, G. A. & Eilertsen. H. C. 1995. Modelling the onset of phytoplankton blooms: a new approach. In: Ecology of fjords and coastal waters, (Skjoldal, H. R., Hopkins, C., Erikstad, K. E.& Leinaas, H. P., eds). Elsevier Science, pp. 73-83. Helbling, E. W, Eilertsen, H. C., Villafañe, V. E. & Holm-Hansen, O. 1996. Effects of Ultraviolet Radiation on Post-Bloom Phytoplankton Populations in Kvalsund, North Norway. 1996. Journ. Photochem. Photobiol. 33(3), 255-259. Aanesen, R. T., Eilertsen, H. C. & Stabell, O. B. 1998. Light-induced toxic properties of the marine alga Phaeocystis pouchetii towards cod larvae. Aquatic toxicology 40, 109-121. Eilertsen, H. C. & Wyatt, T. 1998. A model of Alexandrium population dynamics.1998. In: Harmful Algae , (Reguera, B., Blanco, J.,.Fernandez, M.L & Wyatt, T., eds. ), Xunta de Galicia and Intergovernmental Oceanographic Commission of UNESCO, 1998. pp. 196-200. Romdhane, M. S., Eilertsen, H. C., Daly Yahia, O. K. & Daly Yahia, M. N.. 1998. Toxic dinoflagellate blooms in Tunisian lagoons: causes, and consequences for aquaculture. 1998. In: Harmful Algae (Reguera, B., Blanco, J.,.Fernandez, M.L & Wyatt, T., eds. ), Xunta de Galicia and Intergovernmental Oceanographic Commission of UNESCO, 1998. pp. 80-84. Stabell, O. B., Aanesen, R. T. & Eilertsen, H. C. 1999. Toxic peculiarities of the marine algae Phaeocystis pouchetii detected by in vivo and in vitro bioassay methods. Aquatic toxicology 40(2-3), 109-121, 1998. Eilertsen, H. C. & Holm-Hansen, O. 2000. Effects of high latitude UV radiation on phytoplankton and nekton modelled from field measurements by empirically derived algorithms. Polar Research 19(2), 1-16.
and life history strategies. S. Afr. J. Mar. Sci. 22, 323-338. Hamre, B., Eilertsen, H.C., Stamnes, J.J., Stamnes, K. 2000. The importance of a realistic light regime in marine phytoplankton models. Prestige Publishing: 1-13. Hansen, E., Eilertsen, H. C., Ernstsen, A., & Geneviere, A. M. 2003. Anti-mitotic activity towards sea urchin embryos in extracts from the marine haptophycean Phaeocystis pouchetii (Hariot) Lagerheim collected along the coast of northern Norway. Toxicon 41, 803-812. Hansen, E., Ernstsen, A. 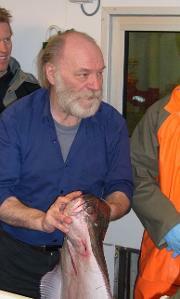 & Eilertsen, H. C. 2004. Isolation and characterisation of a cytotoxic polyunsaturated aldehyde from the marine phytoplankter Phaeocystis pouchetii (Hariot) Lagerheim. Toxicology 199, 207-217. Eilertsen, H. C. & Skarðhamar, J. 2006. Temperatures of north Norwegian fjords and coastal waters: Variability, significance of local processes and airesea heat exchange. Estuarine, Coastal and Shelf Science 67, 530-538. Haslam, R. P., Keys, A. J., Andralojc, P. J., Madgwick, P. J., Andersson, I., Grimsrud, A., Eilertsen, H. C., Parry, M. A. J., 2005. Specificity of Diatom Rubisco. In Omasa, K., Nouchi, I., De Kok, L. J. (eds. ): Plant responses to air pollution and global change. Springer-Verlag Tokyo. pp. 157-164. Eilertsen,H. C., Wyatt, T. & Hansen, E. 2007. Can ultraviolet radiation influence cod (Gadus morhua L.) yearclass strength: a model study. Journal of Fish Biology 70:1120-1133. Hansen, E & Eilertsen, H. C.2007. Do the polyunsaturated aldehydes produced by Phaeocystis pouchetii (Hariot) Lagerheim influence diatom growth during the spring bloom in Northern Norway? Journal of Plankton Research 29:87-96. Eilertsen, H. C. & Frantzen, S. 2007. Phytoplankton from sub-Arctic fjords in northern Norway: I. Seasonal biomass characteristics and bloom dynamics. Marine Biology Research 3:319-332. Norrbin, F., Eilertsen, H.C., Degerlund, M. 2009. Vertical distribution of primary producers and zooplankton grazers during different phases of the Arctic spring bloom. Deep Sea Research Part II. 56:1945-1958. Degerlund, M., Eilertsen, H. C. 2009. Main species characteristics of phytoplankton spring blooms in NE Atlantic and Arctic waters (68-80oN). Estuaries and Coasts. DOI 10.1007/s12237-009-9167-7. Eilertsen, H. C., Degerlund, M. 2010. Phytoplankton and light during the northern high-latitude winter. Journal of Plankton Research. In press. Eilertsen, H. C., Degerlund, M., Parry, M., Andersson, I., Grimsrud, A. 2010. The nitrogen budget of cold water diatoms: indications of temperature regulation of nitrate utilization efficiency. Marine Ecology Progress Series. Submitted.